Arrival Haridwar Railway Station / Hotel, Meet & Assist further drive to Barkot via Dehradun &Mussoorie. Enroute visit Kempty Fall and others later drive straight to your Hotel for night halt. Drive to Rishikesh, the ‘place of sages’ is a celebrated spiritual town on the bank of Ganga and is surrounded by Shivalik range of the Himalayas on three sides. 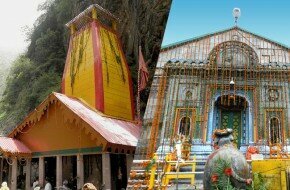 It is said that when Raibhya Rishi did hard penances, God appeared by the name of ” Hrishikesh ” and this area hence firth came to be known as Rishikesh.Enroutevisit Rishikesh Temples & Sight Seeing – LaxmanJhulla, Ram Jhulla, TriveniGhat, Bharat Mandir, Shivananda Ashram, Parmarth Ashram.